At Kirlough Family Dentistry, we want to help every patient struggling with tooth loss discover the reconstructive solution that fits their personal preferences and available budget. 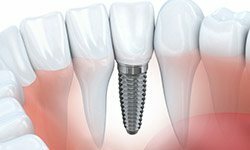 One of the best options available today is dental implants, which offer incredible stability, aesthetic value, and longevity. In fact, implant-retained teeth are virtually indistinguishable from natural ones when completed! To explore this transformative service in greater detail, contact us today and schedule a consultation with Dr. Kirlough. 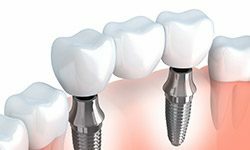 Durability – Implant-retained teeth feel and function just like natural dental structure. Patients don’t have to worry about dietary restrictions! Conservation – The placement of dental implants won’t require any natural teeth to be negatively altered. Aesthetics – Once in place, it’s virtually impossible to distinguish implant-retained teeth from the rest of the smile. Longevity – Dental implants are designed to last for decades. In many cases, patients enjoy them for the rest of their life. 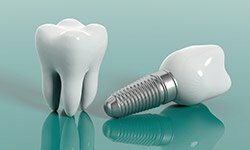 Dental implants are versatile enough to correct a wide spectrum of tooth loss, and Dr. Kirlough will help patients pair them with the ideal restoration for their specific needs and preferences. 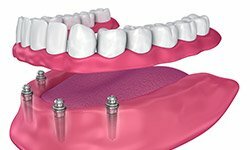 A metal-free, implant-retained crown can be combined with a singular implant. The new “tooth” will fit in right alongside the rest of your smile, and unlike traditional dental bridges, we won’t have to remove a significant amount of healthy dental structure to accommodate its placement. Implant-retained bridges are an excellent choice for replenishing multiple missing teeth that used to appear in a row. Instead of reducing natural teeth to accommodate the new replacement, we can place two dental implants – one on either side of the gap – to anchor the new prosthetic securely in place. Implant-retained dentures are a cost-effective solution for replacing several teeth at once (even entire arches) while still providing a reliably high level of quality. Instead of placing one implant per lost tooth, a small number of implants can be angled strategically in the jawbone to support a full, custom prosthetic all at once. Many general dentists throughout the greater Middleburg Heights community have to refer their patients to separate specialists (such as periodontists and oral surgeons) for the surgical component of their dental implant care. This means extra travel time and cost on the patient’s part; they also have to spend time in an unfamiliar dental office where they don’t know the doctor and team. At Kirlough Family Dentistry, we’re happy to offer every stage of this treatment process right here in our dental office for maximized convenience and comfort! 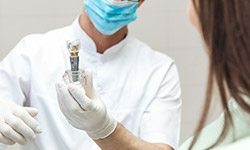 Determining the cost of dental implants is a complex question because this procedure has several components to it – there’s the initial surgical placement of the implant(s), the addition of an abutment (connector), and the design and creation of custom-made restorations. Dr. Kirlough can provide confident, all-inclusive price estimates after an initial consultation, during which he will thoroughly review your oral health and discuss your personal preferences for the treatment process. We encourage patients to keep in mind that while dental implants may seem more expensive at first glance, they can actually end up costing you less over time because they won’t require the same amount of extensive maintenance as more traditional tooth replacement services. They’re designed to thrive for decades or even the rest of the patient’s life!